An unnamed UK metropolis. The future. Renowned photojournalist Jennifer Preston is investigating the aftermath of a terrible explosion that ripped through the city on New Year’s Eve. Known simply as ‘The Catastrophe’, this shocking tragedy has left behind a festering wound. The city is on edge, thousands have evacuated and a sprawling, militarized Quarantine Zone has been erected around the epicentre of the blast. The ‘QZ’, as it becomes known, is a network of empty buildings and abandoned streets, shrouded beneath clinical plastic and fenced in behind impenetrable barricades. Heavily armed security units ensure that nobody goes in and nobody comes out. As unexplained and increasingly bizarre acts of violence erupt across the city, Jennifer begins to notice strange, ephemeral phantoms in her photographs. What begins as an artistic documentation of The Catastrophe’s lingering aftershock soon becomes an obsession with ‘The Phenomenon’. “Since the explosion, since the construction of the Quarantine Zone, my photographs are different. Not knowing what was waiting for me and whether it was worth to watch this alleged horror / mystery (the content seemed interesting to me though), this film visually impressed me afterwards. At the end credits, I was somewhat irritated because the ending made no sense at all and left me with a lot of question marks. Ultimately it was a huge open ending with everything still as mysterious and unexplained as in the beginning. Afterwards I found out that this was a pilot for a brand new television series. What a disappointment ! As a fervent opponent of anything that even resembles a serial, the further course of this nevertheless very intriguing story will be completely unknown to me. However, I am sure that by the third season everything will be very confusing and complicated, because the writers are completely lost and are forced to invent new storylines. That’s nothing for me. The whole story revolves around a massive explosion that occurred in an underground dancing somewhere in futuristic London. According to the government chemicals are released, which leads to evacuating part of the population and a perimeter is established around the disaster area. 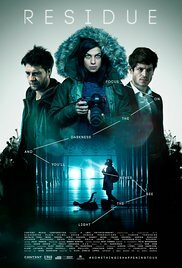 Jennifer (Natalia Tena) and Jonas (Iwan Rheon) witness this explosion and gradually see their part of the city mutate into an area with military control. Jennifer is a photographer who starts to make photos of local residents after the incident and who discovers that these individuals experience a personality change. They get suicidal and turn out to be downright murderous. Jonas is someone who works for the organization who have closed the area in question (all the buildings in this area are covered with plastic, which creates some surreal images) and gradually he becomes aware that there is more to it than an explosion. And finally there is also Levi (Jamie Draven), a police detective whose daughter died in this explosion. “Residue” is a fairly depressing film. Not only because of the futuristic story, but also because of the atmosphere and the used color palette. Everything looks bleak, gray and with no future. In retrospect I understood why the film was so slow without really shocking or relevant incidents. That’s of course because this is just a long intro to a multiple seasons full of episodes. Only the artistic image fragments are momentary attention grabbers. For the most part it’s just observing the main characters wandering around and looking for answers to their questions. After that there’s something paranormal coming up. This makes it a little more interesting. So, are you a TV show freak, then I think this one is worth to watch. Instead, I’ll stick with my addiction to caffeine and nicotine … and I’ll still eschew the “soapine” for the moment!